Inigo de Loyola was born in 1491 in Azpeitia in the Basque province of Guipuzcoa in northern Spain. He was the youngest of thirteen children. At the age of sixteen years he was sent to serve as a page to Juan Velazquez, the treasurer of the kingdom of Castile. As a member of the Velazquez household, he was frequently at court and developed a taste for all it presented, especially the ladies. He was much addicted to gambling, very contentious, and not above engaging in swordplay on occasion. 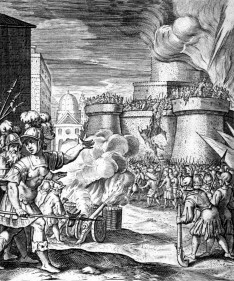 In fact in a dispute between the Loyolas and another family, Ignatius and his brother plus some relatives ambushed at night some clerics who were members of the other family. 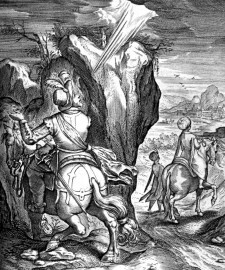 Ignatius had to flee the town. When finally brought to justice he claimed clerical immunity using the defense that he had received the tonsure as a boy, and was therefore exempt from civil prosecution. The defense was specious because Ignatius had for years gone about in the dress of a fighting man, wearing a coat of mail and breastplate, and carrying a sword and other sorts of arms – certainly not the garb normally worn by a cleric. The case dragged on for weeks, but the Loyolas were apparently powerful. Probably through the influence of higher-ups, the case against Ignatius was dropped. Eventually he found himself at the age of 30 in May of 1521 as an officer defending the fortress of the town of Pamplona against the French, who claimed the territory as their own against Spain. The Spaniards were terribly outnumbered and the commander of the Spanish forces wanted to surrender, but Ignatius convinced him to fight on for the honor of Spain, if not for victory. During the battle a cannon ball struck Ignatius, wounding one leg and breaking the other. Because they admired his courage, the French soldiers carried him back to recuperate at his home, the castle of Loyola, rather than to prison. On the feast of Saints Peter and Paul (29 June) he took an unexpected turn for the better. The leg healed, but when it did the bone protruded below the knee and one leg was shorter than the other. This was unacceptable to Ignatius, who considered it a fate worse than death not to be able to wear the long, tight-fitting boots and hose of the courtier. Therefore he ordered the doctors to saw off the offending knob of bone and lengthen the leg by systematic stretching. Again, all of this was done without anesthesia. Unfortunately, this was not a successful procedure. All his life he walked with a limp because one leg was shorter than the other. During the long weeks of his recuperation, he was extremely bored and asked for some romance novels to pass the time. Luckily there were none in the castle of Loyola, but there was a copy of the life of Christ and a book on the saints. Desperate, Ignatius began to read them. The more he read, the more he considered the exploits of the saints worth imitating. However, at the same time he continued to have daydreams of fame and glory, along with fantasies of winning the love of a certain noble lady of the court, the identity of whom we never have discovered but who seems to have been of royal blood. He noticed, however, that after reading and thinking of the saints and Christ he was at peace and satisfied. Yet when he finished his long daydreams of his noble lady, he would feel restless and unsatisfied. 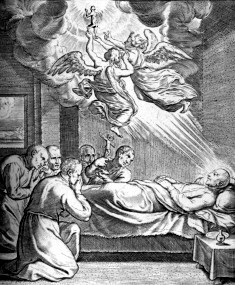 Not only was this experience the beginning of his conversion, it was also the beginning of spiritual discernment, or discernment of spirits, which is associated with Ignatius and described in his Spiritual Exercises. The Exercises recognize that not only the intellect but also the emotions and feelings can help us to come to a knowledge of the action of the Spirit in our lives. Eventually, completely converted from his old desires and plans of romance and worldly conquests, and recovered from his wounds enough to travel, he left the castle in March of 1522. He had decided that he wanted to go to Jerusalem to live where our Lord had spent his life on earth. As a first step he began his journey to Barcelona. Though he had been converted completely from his old ways, he was still seriously lacking in the true spirit of charity and Christian understanding, as illustrated by an encounter he had with a Moor on his way. The Moor and he came together on the road, both riding mules, and they began to debate religious matters. The Moor claimed that the Blessed Virgin was not a virgin in her life after Christ was born. Ignatius took this to be such an insult that he was in a dilemma as to what to do. They came to a fork in the road, and Ignatius decided that he would let circumstances direct his course of action. The Moor went down one fork. Ignatius let the reins of his mule drop. If his mule followed the Moor, he would kill him. If the mule took the other fork he wo uld let the Moor live. Fortunately for the Moor, Ignatius’ mule was more charitable than its rider and took the opposite fork from the Moor. 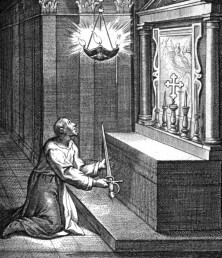 He proceeded to the Benedictine shrine of Our Lady of Montserrat, made a general confession, and knelt all night in vigil before Our Lady’s altar, following the rites of chivalry. He left his sword and knife at the altar, went out and gave away all his fine clothes to a poor man, and dressed himself in rough clothes with sandals and a staff. He continued towards Barcelona but stopped along the river Cardoner at a town called Manresa. He stayed in a cave outside the town, intending to linger only a few days, but he remained for ten months. He spent hours each day in prayer and also worked in a hospice. It was while here that the ideas for what are now known as the Spiritual Exercises began to take shape. It was also on the banks of this river that he had a vision which is regarded as the most significant in his life. The vision was more of an enlightenment, about which he later said that he learned more on that one occasion than he did in the rest of his life. 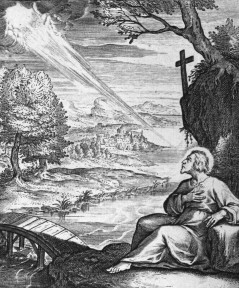 Ignatius never revealed exactly what the vision was, but it seems to have been an encounter with God as He really is so that all creation was seen in a new light and acquired a new meaning and relevance, an experience that enabled Ignatius to find God in all things. This grace, finding God in all things, is one of the central characteristics of Jesuit spirituality. Ignatius himself never wrote in the rules of the Jesuits that there should be any fixed time for prayer. Actually, by finding God in all things, all times are times of prayer. He did not, of course, exclude formal prayer, but he differed from other founders regarding the imposition of definite times or duration of prayer. One of the reasons some opposed the formation of the Society of Jesus was that Ignatius proposed doing away with the chanting of the Divine Office in choir. This was a radical departure from custom, because until this time, every religious order was held to the recitation of the office in common. 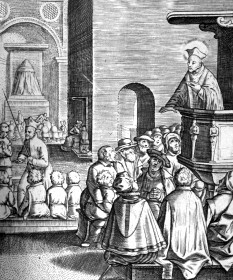 For Ignatius, such recitation meant that the type of activity envisioned for the Society would be hindered. Some time after the death of Ignatius, a later Pope was so upset about this that he imposed the recitation of the Office in common on the Jesuits. Fortunately, the next Pope was more understanding and allowed the Jesuits to return to their former practice. He finally arrived at Barcelona, took a boat to Italy, and ended up in Rome where he met Pope Adrian VI and requested permission to make a pilgrimage to the Holy Land. Once he arrived in the Holy Land he wanted to remain, but was told by the Franciscan superior who had authority over Catholics there that the situation was too dangerous. (Remember, the Turks were the rulers of the Holy Land.) The superior ordered Ignatius to leave. Ignatius refused but when threatened with excommunication, he obediently departed. Ignatius, along with two of his companions, Peter Faber and James Lainez, decided to go to Rome and place themselves at the disposal of the Pope. It was a few miles outside of the city that Ignatius had the second most significant of his mystical experiences. At a chapel at La Storta where they had stopped to pray, God the Father told Ignatius, “I will be favorable to you in Rome” and that he would place him (Ignatius) with His Son. Ignatius did not know what this experience meant, for it could mean persecution as well as success since Jesus experienced both. But he felt very comforted since, as St. Paul wrote, to be with Jesus even in persecution was success. When they met with the Pope, he very happily put them to work teaching scripture and theology and preaching. It was here on Christmas morning, 15 3 8, that Ignatius celebrated his first Mass at the church of St. Mary Major in the Chapel of the Manger. It was thought that this chapel had the actual manger from Bethlehem, so, if Ignatius was not going to be able to say his first Mass at Jesus’ birthplace in the Holy Land, then this would be the best substitute. During the following Lent (1539), Ignatius asked all of his companions to come to Rome to discuss their future. They had never thought of founding a religious order, but now that going to Jerusalem was out, they had to think about their future – whether they would spend it together. After many weeks of prayer and discussion, they decided to form a community, with the Pope’s approval, in which they would vow obedience to a superior general who would hold office for life. They would place themselves at the disposal of the Holy Father to travel wherever he should wish to send them for whatever duties. A vow to this effect was added to the ordinary vows of poverty, chastity and obedience. Formal approval of this new order was given by Pope Paul III the following year on September 27, 1540. Since they had referred to themselves as the Company of Jesus (in Latin Societatis Jesu), in English their order became known as the Society of Jesus. Ignatius was elected on the first ballot of the group to be superior, but he begged them to reconsider, pray and vote again a few days later. The second ballot came out as the first, unanimous for Ignatius, except for his own vote. He was still reluctant to accept, but his Franciscan confessor told him it was God’s will, so he acquiesced. On the Friday of Easter week, April 22,1541, at the Church of St. Paul Outside-the-Walls, the friends pronounced their vows in the newly formed Order. 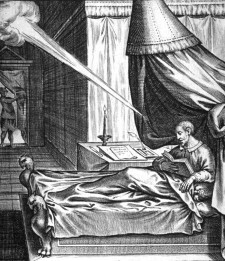 Ignatius, whose love it was to be actively involved in teaching catechism to children, directing adults in the Spiritual Exercises, and working among the poor and in hospitals, would for the most part sacrifice this love for the next fifteen years – until his death – and work out of two small rooms, his bedroom and next to it his office, directing this new society throughout the world. 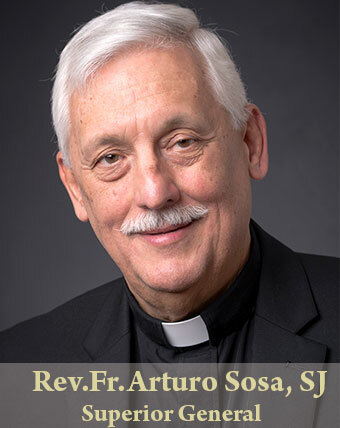 He would spend years composing the Constitutions of the Society and would write thousands of letters to all corners of the globe to his fellow Jesuits dealing with the affairs of the Society and to lay men and women directing them in the spiritual life. From his tiny quarters in Rome he would live to see in his lifetime the Society of Jesus grow from eight to a thousand members, with colleges and houses all over Europe and as far away as Brazil and Japan. Some of the original companions were to become the Pope’s theologians at the Council of Trent, an event which played an important role in the Catholic Counter Reformation. At first Ignatius wrote his own letters, but as the Society grew in numbers and spread over the world, it became impossible to communicate with everyone and still run the new order. Therefore a secretary, Fr. Polanco, was appointed in 1547 to help him in his correspondence. We know that Ignatius wrote almost 7,000 letters during his lifetime, the vast majority of them after he became the Superior General of the Jesuits. Ignatius considered the correspondence between members of the Jesuits one of the most important elements in fostering unity. Separation of Jesuits throughout the world was one of the greatest dangers to the growth, apostolate and unity of the Society. He not only wrote, therefore, to all the houses of the Order, but he also required the various superiors throughout the world to write to Rome regularly, informing him of what was happening. This information could be passed on to the houses of the Society everywhere. In his letters to members of the Society, he treated each one as an individual. He was overly kind and gentle with those who gave him the most problems. On the other hand, with those who were the holiest and humblest, he seemed at times to be too harsh, obviously because he knew they were able to take his corrections without rancor, knowing that Ignatius loved them and was looking only to their greater spiritual good. Fr. James Lainez, one of Ignatius’ original companions, was the provincial in northern Italy. He had done a couple of things that put Ignatius on the spot, including making commitments that Ignatius could not fulfill. In addition, Lainez had expressed his disagreement to others about a change of personnel which Ignatius made. Ignatius wrote to Lainez through his secretary Polanco: “He, (Ignatius) has told me to write to you and tell you to attend to your own office, which if you do well, you will be doing more than a little. You are not to trouble yourself in giving your view of his affairs, as he does not want anything of the kind from you unless he asks for it, and much less now than before you took office, since your administration of your own province has not done much to increase your credit in his eyes. Examine your mistakes in the presence of God our Lord, and for three days take some time for prayer to this end.” So much for saints being all sugar and spice. Perhaps the work of the Society of Jesus begun by Ignatius that is best known is that of education, yet it is interesting that he had no intention of including teaching among the Jesuits’ works at the beginning. As already mentioned, the purpose of the first members was to be at the disposal of the Pope to go where they would be most needed. Before 1548 Ignatius had opened schools in Italy, Portugal, the Netherlands, Spain, Germany, and India, but they were intended primarily for the education of the new young Jesuit recruits. Ten such colleges within six years indicated the rapid growth of the Jesuits. But in 1548 at the request of the magistrates of Messina in Sicily, Ignatius sent five men to open a school for lay as well as Jesuit students. 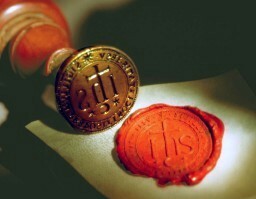 It soon became clear by requests from rulers, bishops and cities for schools that this work was truly one of the most effective ways to correct ignorance and corruption among the clergy and faithful, to stem the decline of the Church in the face of the Reformation, and to fulfill the motto of the Society of Jesus, “Ad Majorem Dei Gloriam,” – to the greater glory of God. This was in keeping with one of Ignatius’ first principles in choosing apostolates: all other things being equal, choose those apostolates that will influence those who have the most influence on others. Maybe the best expression of this idea was in a letter he wrote about the founding of colleges in December of 1551: “From among those who are now merely students, in time some will depart to play diverse roles – one to preach and carry on the care of souls, another to government of the land and the administration of justice, and others to other callings. 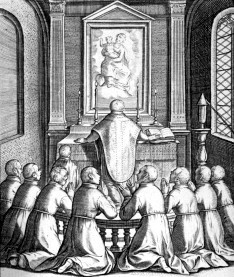 Finally, since young boys become grown men, their good education in life and doctrine will be beneficial to many others, with the fruit expanding more widely every day.” From then on, Ignatius helped establish Jesuit schools and universities all over Europe and the world. Ever since his student days in Paris, Ignatius had suffered from stomach ailments and they became increasingly troublesome in Rome. In the summer of 1556 his health grew worse, but his physician thought he would survive this summer as he had done others. Ignatius, however, thought that the end was near. On the afternoon of July 30th he asked Polanco to go and get the Pope’s blessing for him, suggesting by this to Polanco that he was dying. Polanco, however, trusted the physician more than Ignatius and told him that he had a lot of letters to write and mail that day. He would go for the Pope’s blessing the next day. Though Ignatius indicated that he would prefer he (Polanco) go that afternoon, he did not insist. Shortly after midnight Ignatius took a turn for the worse. Polanco rushed off to the Vatican to get the papal blessing, but it was too late. The former worldly courtier and soldier who had turned his gaze to another court and a different type of battle had rendered his soul into the hands of God. 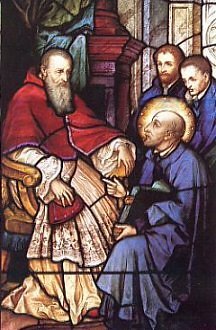 Ignatius was beatified on July 27, 1609 and canonized by Pope Gregory XV on March 12, 1622 together with St. Francis Xavier. Ignatius’ feast day is celebrated by the universal Church and the Jesuits on July 31, the day he died.